The Nook, a 4 star gold and Visit England Rose Gold awarded property, is perfect for a romantic break. The wood burner makes it an ideal cosy retreat any time of the year. Nestling in the grounds of the owners' large Tudor farmhouse (as featured in the publication "The Perfect English Farmhouse" by Ros Byam Shaw) this is a wonderful location to peacefully while away the hours. The Nook is approached by a long gravel driveway and there is private parking adjacent to the cottage. The Daily Telegraph Newspaper review of Packway Farm which included The Nool said it was a "Suffolk Beauty whose stylish renovations acheived a perfect blend of old and new". The Nook offers a stunning open plan living space. The kitchen is fitted with a Belfast sink, electric hob and oven, a fridge with freezer compartment, microwave, coffee machine (Tassimo T discs) and a washing machine. The wood burner brings a cosy traditional feeling to this characterful cottage. A convenient starter basket of logs and kindling is supplied. The dining area has seating for two and there is a comfortable sofa and arm chair. There is a flat screen TV with Free Sat, DVD, and free Wi-Fi connection. The bathroom has a bath and an over the bath shower. Outside there is a table and chairs and BBQ. The owners welcome guests to share the rest of the five acre garden from which there is also direct access to bridleways and footpaths to enjoy the surrounding countryside. The Nook is set in the tiny hamlet of Chediston which is in the heart of the Suffolk countryside just 2 miles from the market town of Halesworth. Minsmere, Dunwich and North Warren Reserves are within easy reach, and the whole area is ideal for walking, cycling, horse riding, bird watching, golf and sailing. There is a secure bicycle store available to guests.Steeped in natural beauty the Heritage Coastal towns of Aldburgh and Southwold are just a 20 minute drive. Slightly closer is the world famous Snape Maltings concert hall with its international musical offerings and in particular its annual festival in June. In addition to those mentioned above there are many pretty villages within a short drive. For example, Framlingham with its castle and Thorpness with its boating lake and "house in the clouds". Further, but still an easy drive, are Woodbridge with its Tide Mill, Sutton Hoo burial ground, Stoneham Barn crafts and birds of prey centre, and Beccles and the Norfolk Broads to name but a few. The prices include all utilities, bed linen, towels, Wi-Fi and a start up basket of logs and kindling. Up to 2 well behaved medium sized dogs are welcome at the Nook. There is a surcharge of £20 per dog payable at the time of booking. Guests are respectfully requested not to allow their dogs into the bedroom or leave them alone in the property at any time. Please be aware there are chickens and ducks in the grounds. Table and chairs available outside the property and use of the 5 acre plot. The Nook.....a little gem in the Suffolk countryside! We had a marvellous stay in The Nook. It felt like home from home. A very tasty welcome pack which was unexpected and a real treat ! Thank you to The Cards,for making us feel like long lost friends. Our two wire haired dachshunds were made very welcome too and they enjoyed exploring the adjacent farm land. Couldn’t recommend this property highly enough. Beautiful property and surroundings, so peaceful and relaxing. We had a fantastic time at the Nook, Packway Farm. Made to feel very welcome and really appreciated our goodie pack. 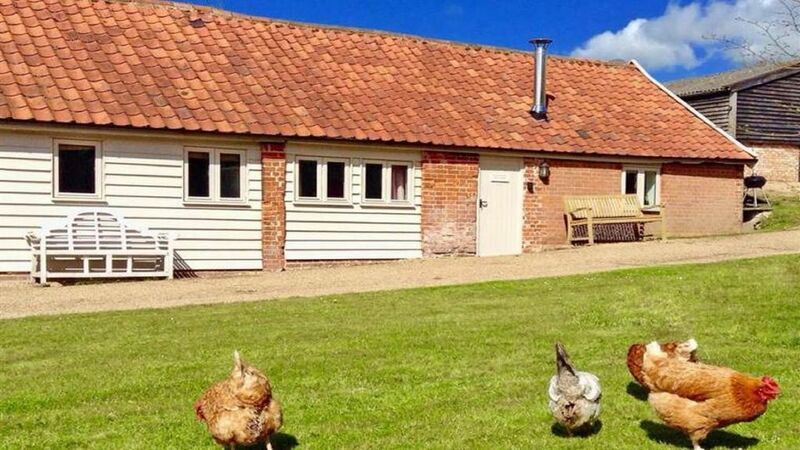 Definitely recommend it as a lovely getaway break in the Suffolk countryside. A lovely place to stay we were sad to leave as had such a fab time. Robert Card the owner was a scream ! Very very helpful and nice to do business with. The farm was beautifully maintained and it’s difficult to fault anything at all. Location was great for us as we cycled everywhere. Lovely to sit and relax in the many chairs strategically place in the grounds to enjoy the setting. Minimum stay 3 nights for weekend breaks.